KIEV, Ukraine -- President Vladimir Putin outlined plans for a ceasefire in eastern Ukraine on Wednesday but Ukraine's prime minister dismissed the proposal, while France expressed its disapproval of Moscow's support for separatist forces by halting delivery of a warship. 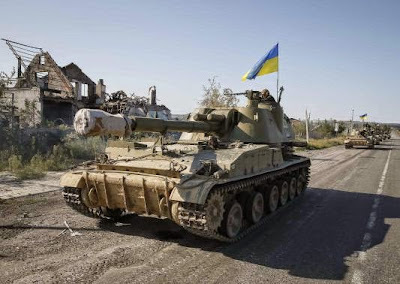 Ukrainian self-propelled artillery guns are seen near Slaviansk September 3, 2014. After speaking to Ukrainian President Petro Poroshenko by phone, Putin said he believed Kiev and pro-Russian separatists could reach agreement at planned talks in Minsk on Friday. "Our views on the way to resolve the conflict, as it seemed to me, are very close," Putin told reporters during a visit to the Mongolian capital of Ulan Bator, describing the seven steps he had put forward to secure a resolution to the crisis. They included separatists halting offensive operations, Ukrainian forces pulling back, an end to Ukrainian air strikes, the creation of humanitarian aid corridors, the rebuilding of damaged infrastructure and prisoner exchanges. Poroshenko indicated the conversation with Putin had injected some momentum into efforts to end a conflict that has killed more than 2,600 people since April, saying he hoped the "peace process will finally begin" at Friday's talks and that he and Putin had a "mutual understanding" on steps towards peace. "The real plan of Putin is to destroy Ukraine and to restore the Soviet Union." U.S. President Barack Obama also voiced caution, saying the conflict could end only if Russia stopped supplying the rebels with weapons and soldiers, a charge Moscow has denied. Visiting the former Soviet republic of Estonia, now in NATO and the European Union, Obama said previous ceasefires had not worked "either because Russia has not been serious about it or it's pretended that it's not controlling the separatists". In a further sign of the West's growing mistrust and disapproval of Moscow over its conduct in Ukraine, France said it would not go ahead with the planned delivery of the first of two Mistral helicopter carriers to Russia. Moscow has said scrapping the 1.2 billion-euro ($1.7 billion) deal would harm France more than Russia and the Defence Ministry described the decision as "no tragedy", but the move is likely to anger the Kremlin and underlines Russia's growing isolation over events in Ukraine. The EU, which has followed Washington in imposing limited economic sanctions on Russia, could agree new moves against Moscow on Friday, hitting the defense and finance sectors. Indicating European leaders were not impressed by Putin's new proposals, French President Francois Hollande's office said he had reached his decision "despite the prospect of a ceasefire, which has yet to be confirmed and put in place". The ceasefire proposals had little immediate impact on the ground. Shelling of the rebel-held city of Donetsk continued and grey plumes of smoke poured up from the area that includes the city's airport. Rebel leaders said they had little faith that Ukrainian forces would observe any truce in a conflict that has left Russia's relations with the West at their worst level since the end of the Cold War more than two decades ago. "A ceasefire is always good but our main condition still stands - to withdraw Ukrainian troops from our territory. That's the only reasonable way," said Vladimir Antyufeyev, self-appointed deputy prime minister of the self-proclaimed Donetsk People's Republic. A truce would provide Poroshenko with some respite to revive a crumbling economy, battered by months of street protests against a president sympathetic to Moscow and then the violence that erupted after his ouster in February, followed by Russia's annexation of Crimea and then prolonged fighting in the east. A ceasefire may also be more welcome to Poroshenko now because his forces have suffered setbacks in the past week. Putin is widely thought intent on ensuring Moscow at least continues to have influence in largely Russian-speaking eastern Ukraine after the conflict ends, though fears of a full-scale invasion by Russia remain in Kiev. Putin's spokesman, Dmitry Peskov, sought to address concerns over the ceasefire proposals by saying they did not address the status of the rebel-held areas. Some rebels want unification with Russia, others want more independence inside Ukraine. Peskov also denied a statement by Poroshenko's office suggesting Putin had agreed a ceasefire. That would imply Moscow was a party to the conflict, and Kiev later amended the wording. Despite Putin's proposals, the Defence Ministry announced plans for huge military exercises this month by the strategic rocket forces responsible for its long-range nuclear weapons, involving 4,000 troops in south-central Russia. Obama made clear NATO, which holds a summit in Wales on Thursday and Friday, would not be cowed. "NATO must make concrete commitments to help Ukraine modernize and strengthen its security forces. We must do more to help other NATO partners, including Georgia and Moldova, strengthen their defenses as well," he said in a speech in the Estonian capital, Tallinn.